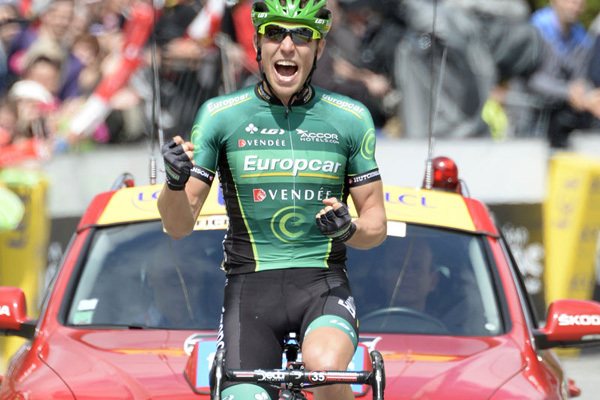 Canadian David Veilleux (Europcar) won the first stage of the 65th edition of the Criterium du Dauphiné by one minute and 56 seconds, he was the lone survivor from the days escape group. Behind him Gianni Meersman (Omega Pharma-Quick Step) and Tom Slagter (Blanco) led home the bunch sprint taking second and third respectively. The win sees Veilleux take the leader’s jersey, which, given his sizable lead he will hope to defend for the next few days, along with the points and climbers jerseys. It is comfortably the biggest win in the 25-year-old’s career, and marks the emergence of an exciting new talent. With so many big climbs packed into just 121 kilometres of racing, the route made for a strange stage, far removed from the opening prologues we’re used to in stage races. Veilluex was aided by the shortness of the stage, which made a long break more likely, though the GC favourites opted not to begin hostilities so early in the race. Veilleux proved the strongest rider from the break of the day, dropping his fellow escapees Jean-Marie Bideau (Bretagne- Seche Environnement), Thomas Damuseau (Argos Shimano) and Ricard Garcia (Euskaltel) towards the top of the category one Col du Corbier with around 45 kilometres to go. The peloton were only really sparked into life by the threat of GC contender Tony Martin, who broke free around 40 kilometres into the stage. Once they brought him back into the group on the penultimate Pas de Morgins climb, they were content to let Veilleux stay free. Big names dropped at various points on the stage include Thomas de Ghent and Andrew Talansky. Both riders look in poor shape with the Tour less than a month away. 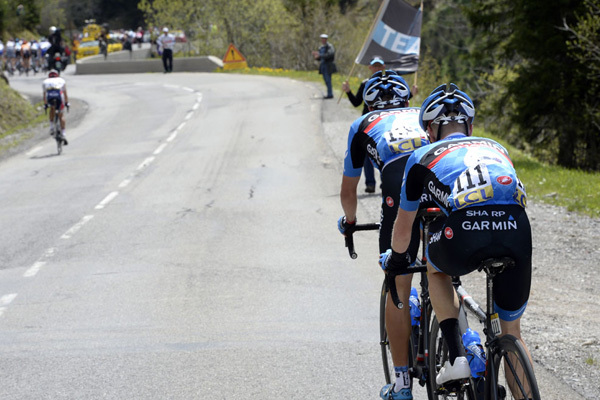 Criterium du Dauphine 2013: Who will win?